Mayor Rahm Emanuel announced the next phase of Open 311, the Mayor’s vision to make Chicago the city with the most accessible and transparent 311 system in the country, by narrowing the list of bidders for contract negotiations to two and launching a comprehensive public engagement strategy to engage Chicago residents on improvements to the 311 system. To ensure that the new 311 system meets the need of Chicago residents, the City will also conduct listening sessions across the City. The City anticipates selecting a final bidder by the end of 2014 with the project slated to begin in early 2015. 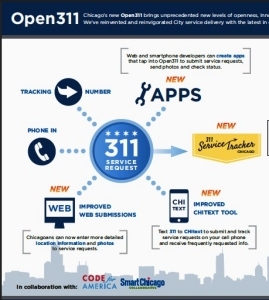 When completed, the Open 311 system will give residents more options for making and tracking service requests, sharing ideas for service improvements, collaborating with their neighbors to take action to improve their communities, and better understanding government operations. Residents will be able to use their smartphones, social media applications, and computers to access Open 311, and the platform will offer real-time status updates. Residents will play an important role in developing the Open 311 platform. The City will engage residents via social media and by hosting neighborhood meetings with community organizations, places of worship, block clubs, and focus groups. 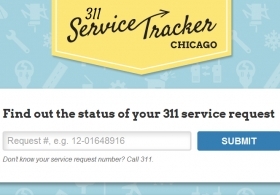 Residents will be invited to offer their views on how the current 311 system can be improved and, once the new system is under development, can participate in testing the new platform to ensure that it meets the needs of Chicagoans. The City will begin holding community listening sessions on improving the 311 system in October, but residents can submit suggestions to Open311@cityofchicago.org.